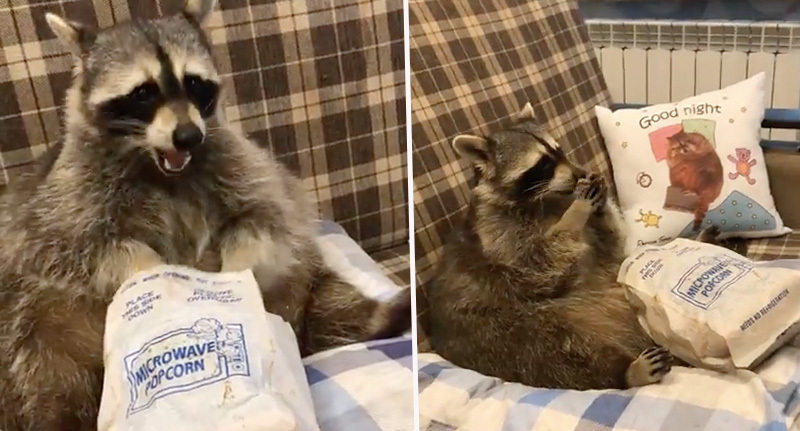 One owner’s pet raccoon loves nothing more than ripping open a bag of popcorn and watching sports. Recording the video, Tema’s owner films him getting cosy on the couch. I really love my pet raccoon Tema. We do different videos with him. He has his own Instagram account and a lot of subscribers. People really like his funny antics. He loves eating popcorn and watching some TV! 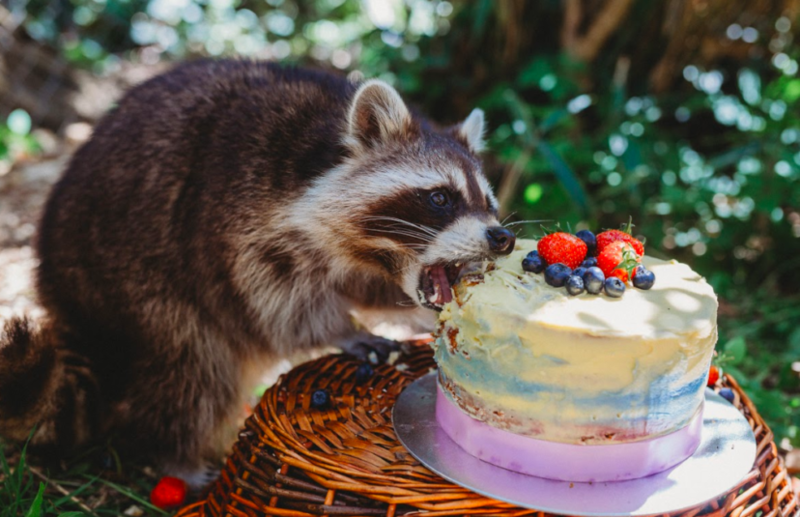 Another pampered raccoon belongs to 24-year-old photographer, Xanthe Rowland, from Burnham-on-Sea, who recently threw an eighth birthday party for her furry friend, Missy. So many of my clients are asking to have their babies photographed with cakes for their first birthdays, where they basically destroy a cake and make as much mess as possible. I love what I do, but I’m always finding ways to switch things up a bit. I’ve always loved animals and thought it would be an awesome idea to try and find an animal to try this with instead. At first I was asking my friends if they had any dogs they’d like to try it with, until I received a message from my friend who is a zookeeper at Tropiquaria, Somerset, and mentioned one of their racoons has a birthday coming up and we could try it with them! I practically bit his arm off at the offer as I thought it was so unique. It’s not every day you get to work with amazing animals! Xanthe, who said she’d never worked with raccoons before, was a little nervous, but it turns out Missy was as well. She was nervous in front of the camera, but then she is a raccoon, so it’s hardly surprising. However, as Xanthe tells us, a delicious animal-friendly banana sponge birthday cake soon tempted her out to play. There are two racoons in the enclosure, Archer and Missy, and they are both ex-pets and have been rescued and relocated to the zoo. I’ve visited them a few times and Missy is typically a bit grumpy when she isn’t being bribed with food. She’s friendly but a bit sassy and very inquisitive! So much like a typical racoon. Archer is much more likely to come running up to you if you have something sweet for him, but both of them will be your best friend if you’ve got a treat for them. Racoons are VERY driven by food haha!